Ancient Egypt, New Kingdom, Ramesside Period, 19th to 20th Dynasty, ca. 1295 to 1070 BCE. 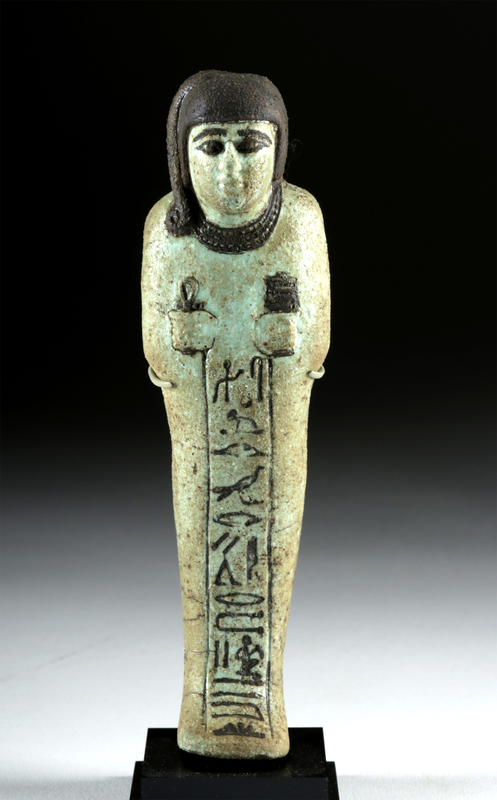 A mold-formed faience ushabti covered in a pale blue-green glaze and accentuated with black-painted details. 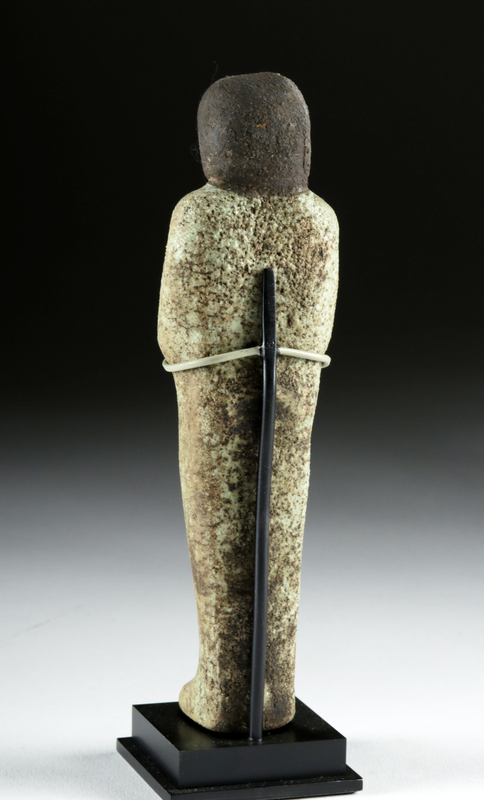 The figure stands in mummiform atop fused legs, holds an ankh and a djed pillar in the crossed hands, and wears a broad pectoral collar. The serene visage is composed of black-painted brows and eyes with elongated outer corners, a wide nose, and full lips curled into a slight smile, all beneath a black wig with a sidelock of hair. 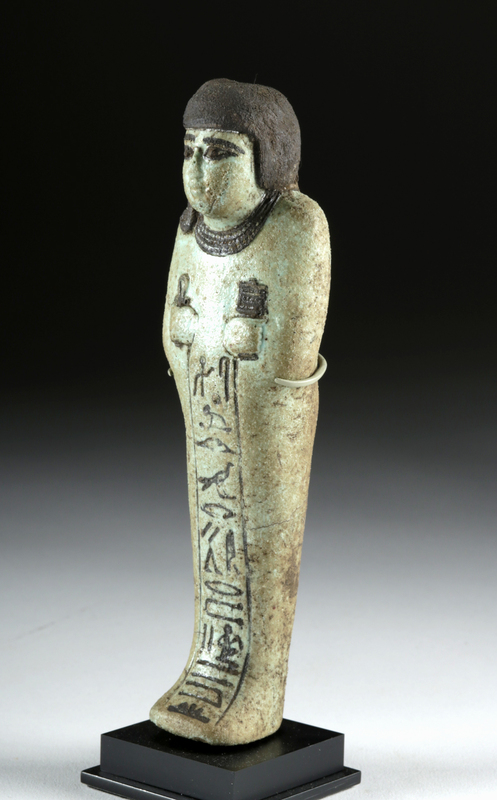 The front of the legs displays a column of inscribed hieroglyphs brought forth with black pigment and identify this figure as Hori with a dedication to Osiris. Size: 1.6" W x 5.625" H (4.1 cm x 14.3 cm); 6.2" H (15.7 cm) on included custom stand. Ushabti (or shabti) dolls are figures shaped like adult male or female mummies wearing traditional ancient Egyptian headdresses. The ancient Egyptians believed that after they died, their spirits would have to work in the "Field of Reeds" owned by the god of the underworld, Osiris. This meant doing agricultural labor - and it was required by all members of society, from workers to pharaohs. 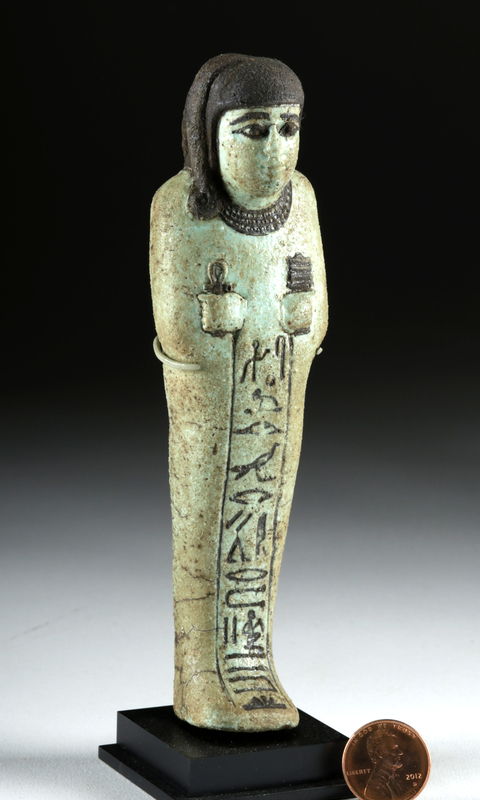 The wealthier nobility in Egyptian society were able to have shabtis made of faience; its color was meant to reflect the color of the river Nile both on earth and in the afterlife. Condition: Minor nicks and abrasions to head, body, and base, with fading and darkening to areas of glaze coloration, and light softening to some finer details, otherwise intact and excellent. Light earthen deposits throughout, and nice craquelure to glaze in some areas.